On the sidewalk below a nondescript office building nestled behind D.C.’s Union Station, a dozen activists are camped out. It’s Day 4 of their 18-day hunger fast outside a little-known federal agency. As a result of their fast, and earlier more confrontational actions, the Federal Energy Regulatory Commission has become more widely known, if not loved, by activists. The agency regulates interstate oil and gas pipelines, but activists say it’s been captured by industry and is more rubber-stamp than regulator, and has allowed U.S. fracking to grow uncontrollably. “It’s going to take a lot more than we’re doing now to fix this situation,” said a seated and tired Lee Stewart, who’s participating in the fast. Now living in D.C., Stewart, 28, first heard about FERC when a compressor station in his hometown in Loudon County, Va. was being expanded to allow for increased capacity to transmit fracked gas to Cove Point, a controversial FERC-approved facility in Lusby, Md. After Dominion, the Va. power giant, completes the $3.8 billion Cove Point plant, it will convert fracked gas into highly condensed Liquefied Natural Gas, then ship it to India and Japan. Stewart didn’t hear about the expansion of the compressor station until after it was too late to stop it. “That was my introduction to FERC,” said Stewart, who’s now an organizer with Beyond Extreme Energy, the group organizing the “No New Permits” hunger fast. The story that led to Stewart’s activism is playing out all over, as fracked gas courses through an expanding network of pipelines crisscrossing the country. FERC has strong financial motivation to approve what comes before it, since its funding comes from charges and fees assessed on the projects and companies it regulates. This funding arrangement, as well as the agency’s “revolving door” with industry, may be why FERC has in the past shown “a shocking absence of regulatory vigilance,” according to a report in the wake of the Enron scandal by then-Sen. Joe Lieberman, who chaired the Governmental Affairs Committee. “Oftentimes, FERC seemed to view itself not as a regulator but as a facilitator – not as a market cop, but as a market cheerleader,” noted the report. “All over New England there are plans for pipelines that are springing up,” said Lyn Shaw, who was spry on her feet despite being in her fourth and, for her, final day of fasting. The 71-year-old from Middletown, Ct. was back in front of FERC – where she and 100 others were arrested last year for blockading the building – because she worries about climate change’s destabilizing impact and what kind of world she’ll be passing on to her grandchildren. Pope Francis shares those concerns, as he made clear in his 184-page papal encyclical on climate change. 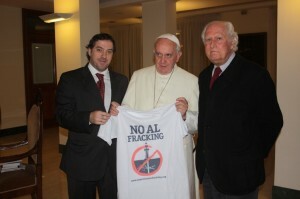 “I’m really glad that the Pope is a climate activist,” said Charles Chandler, a fasting 59-year-old grandfather from Fort Bragg, Ca., whose t-shirt read “Hunger for Climate Justice.” Chandler was seated not too far from a picture of the Pope meeting with anti-fracking activists and holding up a t-shirt that says “No to fracking” in Spanish. Sensing they have an ally in the Pope, the activists have timed their action to coincide with Francis’s visit and are breaking their fast on Sept. 25th, the day after he addresses a joint session of Congress.